Works with the Zoe+Ruth ZR-CR200 Rechargeable Callus Remover Foot File. High Quality Micro-Abrasive Mineral Particle Roller Heads. Buffs away hard and cracked skin in minutes. Works on Callus, Corn or any hard skin. Men and women can use. Can I clean these in water? Yes, these can be cleaned in water or with the brush supplied with the case when you bought the Zoe+Ruth Callus Remover. What can I do for really tough calluses? Tough calluses may require a few sessions. Turn the unit on and gently rotate (back and forth or side to side) over the callous/corn/hard skin area for 2-3 seconds. Do not press hard; just gently glide it over the area. Check if you have achieved the softness you desire. If not, go over the area again for 2-3 seconds. Continue to use this method until the level of softness is obtained. You may want to wait a day or two in between sessions. Do not use on skin that is red, irritated, inflamed, infected or blistered. The Zoe+Ruth Callus Remover is intended for one person. You may share the Callus Remover unit but you must each use different rollers. For hygienic reasons the rollers are recommended for one person only. Is the Zoe+Ruth Callus Remover only for women? No. Of course, men can also use the Zoe+Ruth Callus Remover too. Since men tend to have rougher calluses we have the 2x spare rollers on Amazon with extra coarse micro-abrasive heads. Does the Zoe+Ruth Callus Remover hurt? No. 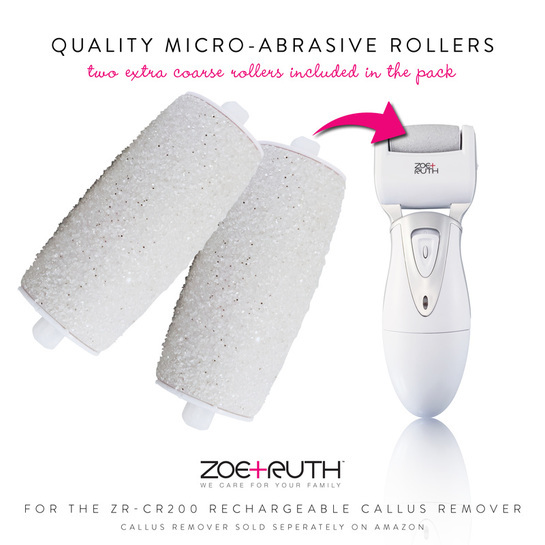 The Zoe+Ruth Callus Remover is safer and more effective than metal scrapers, which use blades to remove the dead skin and can lead to cuts. The Zoe+Ruth Callus Remover has micro minerals that gently and effectively buff away hard skin without the risk of cuts.